Breast cancer has likely affected every person reading this in some way. This is the reason why Smart Circle sees the Breast Cancer Research Foundation as an organization that needs our help through donations and spreading the word. During the month of July we celebrated a major milestone with our commitment to help find a cure for breast cancer. Currently through the FW1 Pink Promotion, for each specially marked can of FW1 automobile waterless wash and wax products, fifty cents is donated to the Breast Cancer Research Foundation. The FW1 Pink Promotion program dates back to January of 2013 and we are more than happy to be a part of this for the long run! The FW1 Pink Promotion has resulted in $5,000,000 donated to BCRF to help find a cure for breast cancer. 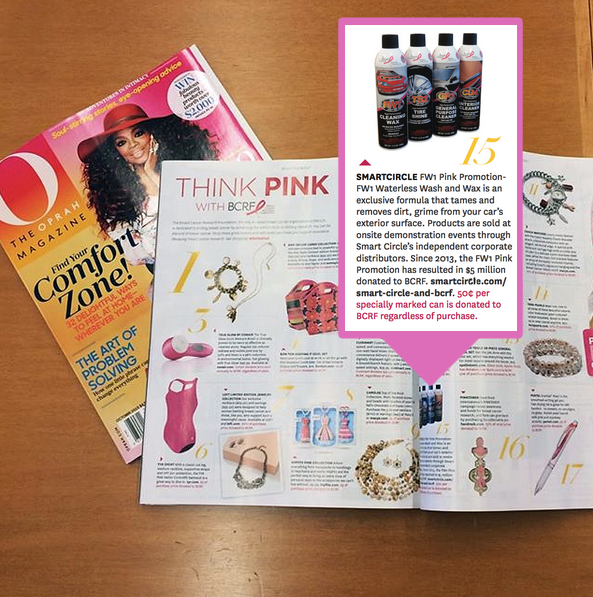 The FW1 products were even featured in O Magazine alongside some other products supporting the cause. From companies that sell jewelry to handbags, keychains to pens, people have offered their support in the search for a cure. Together we can #BeTheEnd of breast cancer, but only if we work together to find a cure. Learn more about our commitment to the BCRF and what we have done to help find a cure.